It’s perfectly okay if only one or two parts of Stoicism interest you. Even people who call themselves “modern Stoics” are rarely fully committed to all five points. 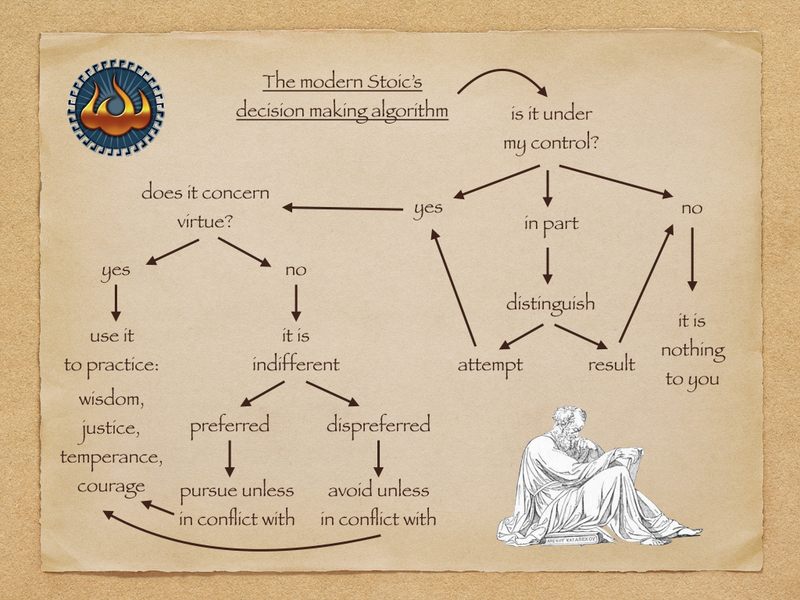 An infographic by Leah Goldrick, explaining the three pillars of Stoic ethics. The Stoic’s practical world view is based on three highly idealistic beliefs about who humans are and who we can (and ought to) become. Tranquility: There is a rational component to our emotions. By paying attention to our thoughts (which are the only thing we can really control), we can reduce anxiety and achieve consistent tranquility and joy.This “therapeutic” component is by far the most popular part of Stoicism—many people focus on it exclusively. The pursuit of virtue as the highest good tends to be emphasized by people who are more committed to Stoicism as a holistic world view. The ancient Stoics did not believe that we could ever actually attain these ideals perfectly—mortals rarely or never become true Sages—but they found great value in pursuing their understanding of what a truly wise and virtuous person would look like. All schools of ancient philosophy, but especially the Stoics, saw ethics as the most important part of scholarship. But they also recognized that your broader world view would have a big impact on the form your ethics takes. Providence: Classical Stoic theory is rooted in the idea that we should “follow Nature,” because the universe is rational, and humans are created to pursue a particular kind of excellence. They had a scientific notion of God that is somewhere in between atheism and theism as we know it today.For more on this, and to see how modern Stoics navigate what some would call outdated theological ideas, see my post on Zeus for Atheists. Physics: More generally, the Stoics saw all the branches of knowledge (logic, physics, and ethics) as deeply interrelated. Our study of nature always has something to say about how we should live. The reality is that few people would be excited about Stoicism today if they didn’t identify strongly with the Greek and Latin books that have survived from Stoic authors. Stoic literature is full of rich metaphors, candid descriptions of daily life in the Empire, and heated debates with their philosophical rivals (especially the Epicureans). The Moral Letters of Seneca (4 B.C. to 65 A.D). Do this above all, dear Lucilius: learn how to experience joy. Do you now suppose that because I am removing from you the sweetest of beguilements, I am taking away many pleasures? Not at all: what I want is that gladness should never be absent from you. I want it to be born in your own home—and this is what will happen if it comes to be inside you. Other delights do not fill the heart; they are trivial feelings that merely smooth the brow. We have come into being to work together, like feet, hands, eyelids, or the two rows of teeth in our upper and lower jaws. To work against one another is therefore contrary to nature; and to be angry with another person and turn away from him is surely to work against him. So there is your taste of Stoicism! If you like what you see, there are lots of resources for learning more—starting with the excellent posts over at Stoicism Today. For some accessible, long-form reading, I’ve particularly enjoyed Irvine’s Guide to the Good Life: The Ancient Art of Stoic Joy (2008) and Donald Robertson’s Stoicism and the Art of Happiness (2013). ^Obligatory disclaimer: Stoicism was the preferred philosophy of a huge number of people across the ancient Roman world, and it survived as an active school for nearly 700 years. Any bullet-point summary will of course be a simplistic caricature!